These Halloween Marshmallow Pops are too good to pass up. Are you looking for an easy Halloween food craft to do with the kids? This ooey-gooey treat is so much fun and tasty too. I think marshmallows are one of my kids’ favorite desserts and with good reason. Any which way you serve them – they work! 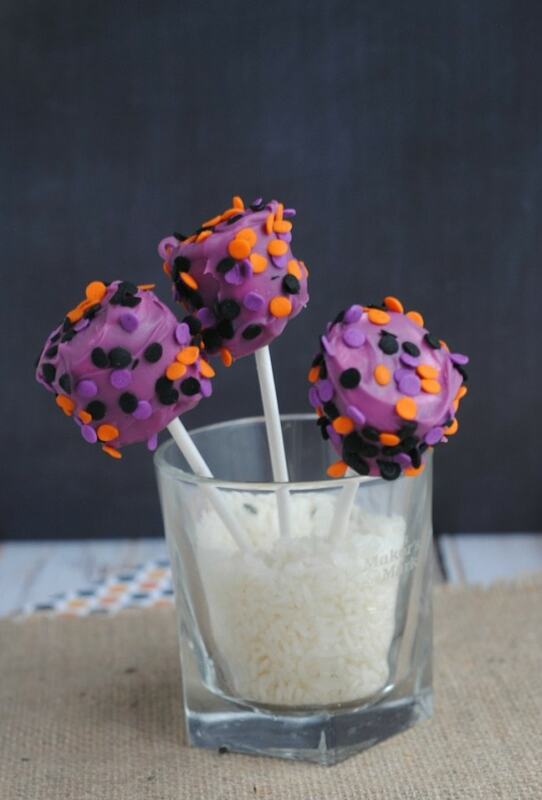 Well, this Halloween Marshmallow Pops recipe is colored to resemble something a bit spooky. Reminds me of a goblin, right? Or some fun little creature. You can play around with the colors if you’d like, but the flavors will be the same – and the happy smiles from the recipients as well. 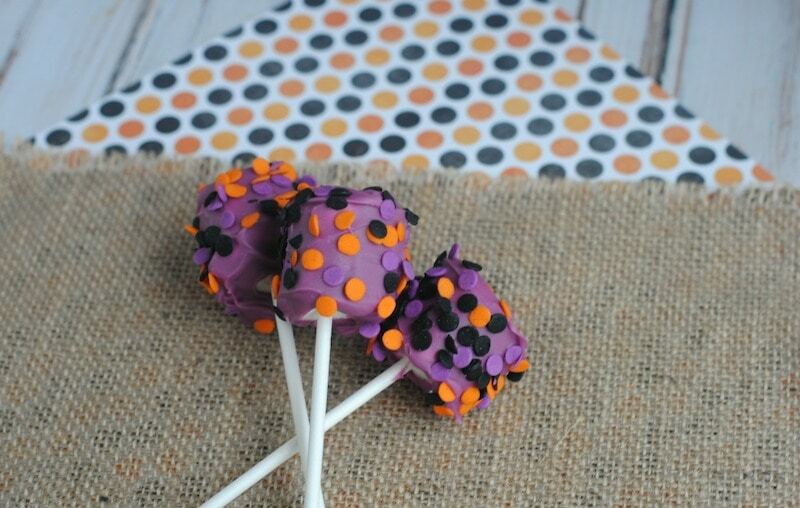 Halloween Marshmallow Pops make great party props. I just love how bright and bold they are. The kids will race right towards them if you decide to use them as table centerpieces. Consider places them inside medium-sized vases. Or better yet, place them on every dish as you set a table. What a way to welcome friends to sit down for a meal. Lots of options with this sweet treat. So many spooky options. Marshmallow pops are totally versatile! I will say that you probably do NOT have most of these ingredients at home. You will need to go out and grab a few of these items at your local craft store. 10 Wilton candy sticks – get the thicker candy sticks, the thin one don’t hold the weight of the marshmallow and chocolate. #1. Insert one candy stick into the base of each marshmallow and set aside. #2. In a microwave-safe dish, heat the purple chocolate candy melts in 30-second increments. Stir every 30 seconds until melted. My microwave took about 2 ½ – 3 minutes. Let cool 3-4 minutes before dipping your marshmallows. #3. Dip each marshmallow one at a time in the purple chocolate. Use a small spoon to help cover the marshmallow completely and let the excess chocolate drip back into the bowl. #4. Sprinkle the marshmallow with the Halloween sprinkles before the chocolate sets and stand the marshmallow up in the cup/mug. #5 Repeat steps #3 and #4 with all the marshmallows. Once they are all dipped and sprinkled place the mugs in the fridge for about 15-20 minutes to allow the chocolate to harden. If not serving immediately, store these Halloween marshmallow pops in a cool dry are so the chocolate does not melt. *Makes 8-10 servings. 1 marshmallow = 1 serving. 10 Wilton candy sticks – get the thicker candy sticks the thin one don't hold the weight of the marshmallow and chocolate. If not serving immediately store in a cool dry are so the chocolate does not melt. 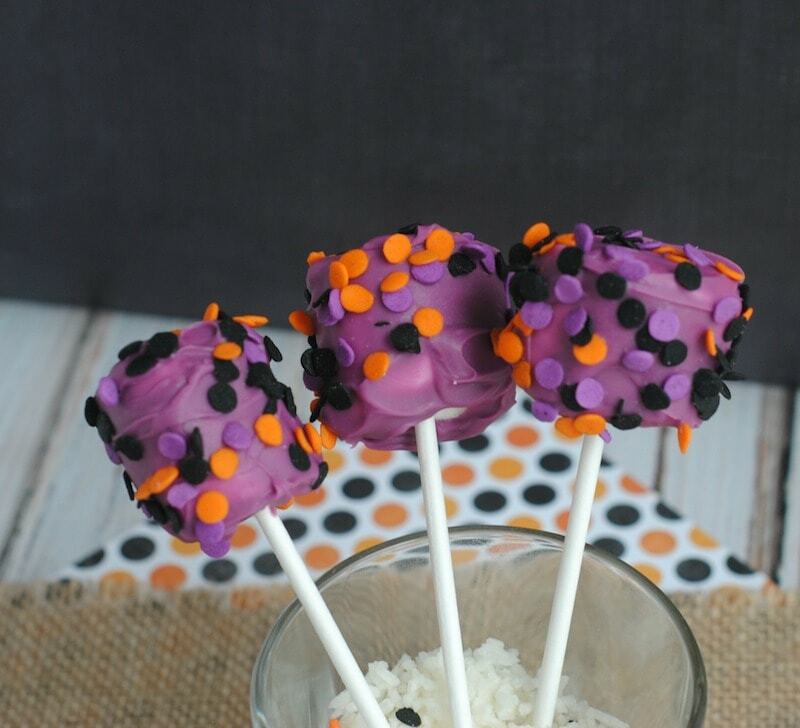 What do you think about this Halloween Marshmallow Pops Recipe?? Something you’d like to try? Are your children fans of marshmallows like mine are? Would love to know what you do for Halloween! You could also give my Mummy Brownies Recipe a shot if you are still looking for more Halloween fun. I personally don’t like marshmallows – BUT, my nieces and nephews will love these, and they look easy to make – thanks!